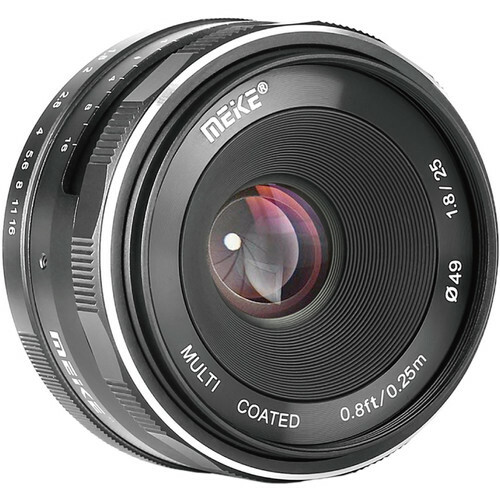 Providing a natural field of view, the Canon EF-M-mount MK-25mm f/1.8 from Meike is a versatile lens, suitable for a range of subjects from portraits to landscapes. The bright f/1.8 maximum aperture enables working in difficult lighting conditions and also offers increased control over depth of field for isolating subject matter with selective focus. Additionally, this manual focus lens permits working with subjects as close as 9.8" away and printed focusing and depth of field scales aid with zone- and pre-focusing techniques. This slightly wide prime is designed for APS-C-format Canon EF-M-mount mirrorless cameras and provides a 40mm equivalent focal length. Bright f/1.8 maximum aperture benefits working in low-light conditions and also affords greater control over depth of field. Manual focus design permits working with subjects as close as 9.8" away. All-metal lens barrel has a smooth, frosted surface and a metal bayonet mount also affords increased rigidity and mounting accuracy. Box Dimensions (LxWxH) 3.8 x 3.7 x 3.1"